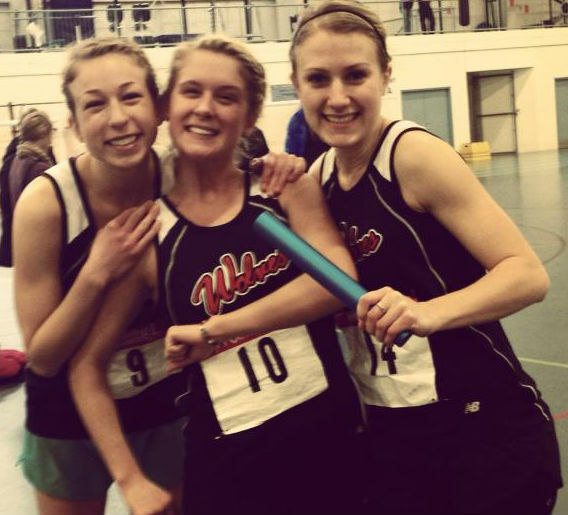 With a win in the 800m, and three other podium finishes, Jamie Wigmore led the GPRC women to a second place finish at the 2013 ACAC Indoor Track Championships at the Edmonton Garrison on Saturday. MacEwan University won the womens title. Concordia University College placed third. By scoring 30 points, Wigmore tied for first along with MacEwan’s Alex Gordichuk and Concordia’s Marriya Jenkins for most points scored by a female athlete. With the number-one ranked ACAC 400m and 800m runner Joren Manz sidelined with a stress fracture, the Wolves men were in tough. Collectively, the GPRC finished 6th in the mens standings. Lethbridge College edged out SAIT for the win; Concordia University College placed third. Hayden Hollowell was the top Wolves male performing, placing 8th in the 1500m (4:16 – personal best and school record), 6th in the 3000m, and anchoring the Wolves mens 4 x 400m team to a 6th place finish. Two other Wolves athletes had top 8 placings. Amanda Patteson finished 5th in the 3000m and 8th in the 1500m, while Kayla Hardy placed 6th in the 1500m and 8th in the 3000m. This entry was posted in Indoor Track and Field and tagged ACAC, CFB Edmonton, Concordia University College of Alberta, GPRC, GPRC Wolves X-C Running, Grande Prairie Alberta, Indoor Track, Lethbridge College, MacEwan University, Track and Field, Wolves. Bookmark the permalink.